1st Row: Mike Body, Teddy Dhein, George Bergeron, Tommy Gravon, Jerry Williver. 2nd Row: Kent Mathiot, Lynn Bohna, Steve Centoni, Carol Frederick, Douglas Conner, Gary Houston. Julie Yoder, Teresa Wherritt. 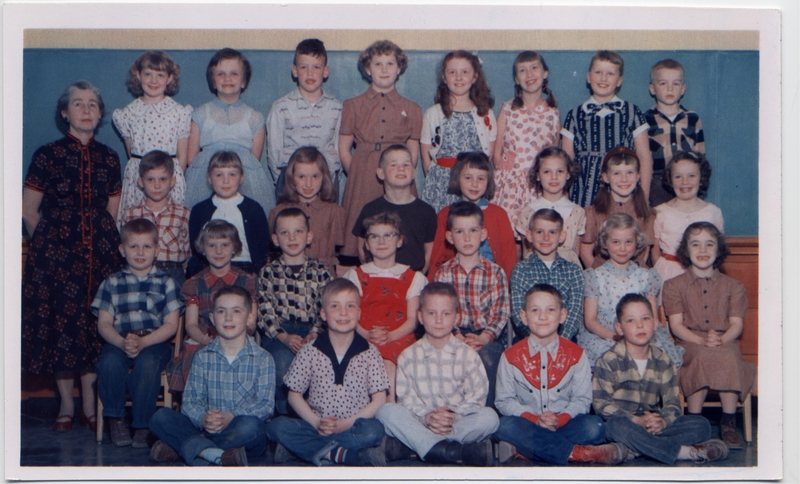 3rd Row: Jock Elliot, Cindy Folquet, Deborah Pauly, Carl Brelin, Diana Callahan, Carolyn May, Janet Goodnight, Robin Huffman. 4th Row: Sandra Fillman, Dolores Perez, Danny Herndon, Gretchen Franz, Carren Foley, Christine Flaherty, Cathy Carney, Ronnie McNamara. Class of 55-56, 134 - Schools, Lake Grove, class photo. Mrs Hargreaves. Description Clara Hargreaves is the teacher. Transcription 1st Row: Mike Body, Teddy Dhein, George Bergeron, Tommy Gravon, Jerry Williver. 2nd Row: Kent Mathiot, Lynn Bohna, Steve Centoni, Carol Frederick, Douglas Conner, Gary Houston. Julie Yoder, Teresa Wherritt. 3rd Row: Jock Elliot, Cindy Folquet, Deborah Pauly, Carl Brelin, Diana Callahan, Carolyn May, Janet Goodnight, Robin Huffman. 4th Row: Sandra Fillman, Dolores Perez, Danny Herndon, Gretchen Franz, Carren Foley, Christine Flaherty, Cathy Carney, Ronnie McNamara. Class of 55-56, 134 - Schools, Lake Grove, class photo. Mrs Hargreaves. Physical Description H 4.75" X L 8"